German and Austrian artists popularized postcards in the early 1900s when it only cost a penny to send a card. This card shows the German influence in the furniture, the table and chair, as well as the hunting hat with the feather in it. Postcards have inspired me throughout my career. The whimsical, colorful images seem to bring out the child in me. I’m in love with this sweet Dutch card. The little girl is so adorable and the baby chicks as cute as can be. Do you know what “Pipka” means in Czech? It means “little yellow chick.” So you can see why I am drawn to this card. We’re experiencing a snow storm today so I thought this might be the perfect vintage Easter postcard to share with you. Let’s hope it melts before the Easter bunny comes! Last year we had 30 inches of snow in April. 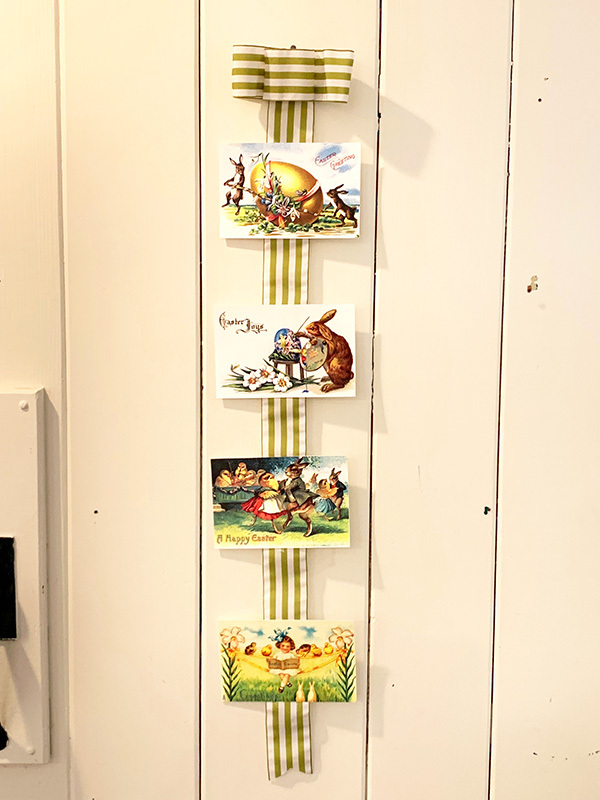 These cards are darling for Easter decor. If you'd like a free downloadable e-book of more cards, just fill out the form on the right. Scatter them around the house or make a simple door decoration to welcome guests. Just glue to a ribbon and hang! Whether snowy, or warm and sunny, Happy Easter!